Taken from Lisa Faulkner’s book ‘Recipes From My Mother For My Daughter’. 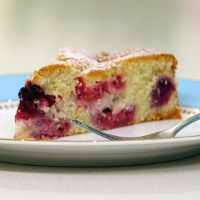 This cake works with most kinds of fruit so use whatever is in season or is your favourite. Preheat the oven to 160°C, gas mark 3 and grease and line a 23cm loose-bottomed cake tin. 1. Cream the butter and sugar together in a large mixing bowl until light and fluffy. Then add in the flour, eggs, milk, ground almonds and almond essence and mix well. Stir in the fruit, reserving a handful for decorating. 2. Pour the mixture into the cake tin and put the remaining handful of fruit on top of the cake. 3. Bake in the preheated oven for about 1-1¼ hours. To test if it is cooked, pierce the cake with a skewer – if it is clean when you pull it out the cake it cooked, if it’s not, return the cake for another 5-10 minutes and check again. Careful to not overcook! 4. Turn the cake out of the tin onto a wire rack to cool and dust with icing sugar. It is best served just as it is turning from warm to room temperature.